This once in a lifetime journey takes you from the emerald waters of Seattle, Washington through the visual splendor of the Cascade Mountains before ascending the Canadian Rockies to bask in the natural beauty of Lake Louise and Banff, Alberta. From Canada we will cross back into the United States through the razor sharp peaks of Glacier National Park and the majesty of Yellowstone National Park and her most cherished treasure, “Old Faithful”. Our journey culminates with a ride through the stunning landscapes of Southern Idaho and Northern Utah, and a possible journey to one of North America’s most unique landscape – the Bonneville Salt Flats. We end our journey in the vibrant Salt Lake City nestled between the Wasatch Mountains and the Great Salt Lake. Welcome to one of the most beatiful cities in the United States, Seattle, Washington. Enjoy a long leisurely stroll down the famed Seattle waterfront, enjoy a ferry ride on Elliot Bay, visit the Space Needle, or try your hand throwing salmon at the world famous Pike’s Place Market. Tonight we will take in a great dinner at a local landmark restaurant. We’ll enjoy our morning coffee along the river before heading north and crossing the border into the heart of Canada’s wine country, Oliver, B.C. After crossing the border, we will explore roads that wind through vineyards and fruit stands and lunch along the shores of Canada’s beautiful Lake Okanogan. From here we head northwest, riding through the majestic mountains rising in the distance as we make our way to our home for the night in Kamloops, B.C. where we will enjoy some Canadian hospitality. Today we head towards Alberta, and the heart of the Canadian Rockies. Our ride will take us along the north Thompson River on the beautiful Yellowhead Highway. There is a good chance of seeing eagles, deer and moose along this stretch, as well as stopping to take in the stunning waterfalls near Clearwater. We will also enter Mt. Robson Provincial Park for a stunning view of the 5000’ Emperor Face on Mt. Robson. 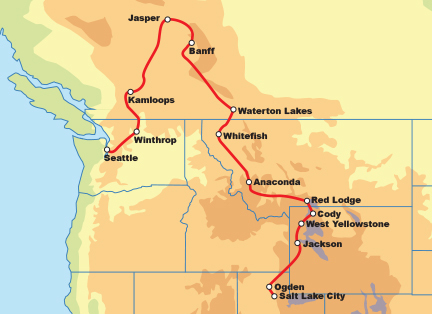 From here, our ride will take us to the heart of Jasper National Forest and the great mountain village of Jasper, Alberta. Jasper holds a special place in our hearts as it marks the beginning of Canada’s amazing Route 93, or Icefield Highway, that runs from Jasper to the breathtaking lakeside village of Lake Louise, Alberta. Get ready to ride a stretch of highway that the EagleRider team would definitely rank among the top ten motorcycle rides in North American. Canada’s Highway 93, also known as the Banff – Jasper Highway, takes us along glacial peaks and across some of Canada’s most stunning ice fields. Today promises to be one of the great riding days of your life, guaranteed! Tonight we enjoy the vibrant Rocky Mountain village of Banff, Alberta, known for friendly people, good food and great nightlife. This trip seems to be leading our group from one incredible destination to the next, and today promises to continue with that theme. We will ride over the stunning Kananaskis Pass where you are likely to see Big Horn sheep wandering along the road. We will lunch in the small pioneer town of Pincher Creek and then head to Waterton Lakes National Park for the night. Waterton is on the Canadian side of Glacier National Park, one of the most visually stunning places in North America. In Waterton we will enjoy a quiet, serene afternoon and evening on the glassy waters of a crystal clear lake. It is hard not to feel as if you are becoming a part of this place. Soak it in. This is what life is all about. What better way to welcome our group back to the United States than with a ride through the amazing vistas of Glacier National Park. Glacier, the nation’s 10th National Park, is known for its deep glacial valleys and rugged peaks. For motorcycle enthusiasts, it is simply an assault on the senses and offers some excellent riding terrain on one of the National Park’s oldest, historical roads – the Going to the Sun Road. Tonight we will explore the Montanan town of Whitefish to explore it’s markets, bars and live music. As we leave the stateside Glacier National Park, we turn our bikes southeast and explore why Montana is knowns as the Big Sky State! We will stick to the two-lane roads, passing by lakeshores and through the cattle country that defines this area. A stop for lunch in the small, pioneering town of Ovando will give you a chance to soak explore the extensive Montana history of this area. For thousands of years Native American tribes have made this area home, and later explorations by Merriweather Lewis and mining discoveries created this town. Our day ends at the resort of Fairmont Hot Springs where we can soak in the hot water and celebrate our day. Today we will continue to explore some of the pioneering history of Montana, stopping in the historical gold-mining towns of Virginia and Nevada cities. If you haven’t felt it before, you will definitely feel as if you’ve stepped back into time in the old West. Our ride will continue through the city of Bozeman, eventually turning off onto the small roads that climb towards the mountain town of Red Lodge. Get a good’s night sleep, as tomorrow we tackle the Beartooth Highway and Chief Joseph passes! Get ready to ride what many consider to be two of the top motorcycle rides in North America, Chief Joseph and the Beartooth Pass. There is simply no way to put into words what lies ahead today. We will cruise at a nice easy speed, stopping often to capture awe inspiring photos of the scenery and glimpses of wildlife. When this day is over we will all look at one another with a big grin and wonder out loud if today was all just an amazing dream. We will stay tonight in the classic western town of Cody, Wyoming, once home to Buffalo Bill Cody. After dinner you can walk down the street to enjoy some local history or head to the local Cody Rodeo to watch cowboys on bucking broncos and bulls. It’s the Wild West! Today is your day to simply kick up your boots and relax in Cody. Incorporated in 1901, Cody, Wyoming is located 52 miles from Yellowstone National Park’s east entrance. Cody was founded by Colonel William F. “Buffalo Bill” Cody who passed through the region in the 1870s. He was so impressed by the development possibilities of irrigation, rich soil, grand scenery, hunting, and proximity to Yellowstone National Park, one of the most amazing landscapes and wildlife habitats on the planet, that he returned in the mid-1890s to start a town. Cody has many activities to offer – from white water rafting to experiencing the amazing Buffalo Bill or Cody Firearms museums. We are running out of adjectives to describe this incredible region of the world and today is no different. Today will be spent winding our way through parts of Yellowstone National Park, stopping to experience the majesty of Yellowstone Falls and the Grand Canyon of the Yellowstone, Mammoth Hot Springs, Hayden Valley and all of its extraordinary wildlife. Tonight we will stay on the edge of the park in West Yellowstone so we’ll be primed for our more part exploration in the morning. This morning we will ride through geyser country to have a coffee and watch the greatest geyser of all do its thing – Old Faithful! From here we will make our way along Jackson Lake and in Grand Teton National Park for scenic stops and lunch. Our home tonight is nestled in one of the most famous and exclusive ski resort areas of the United States, Jackson Hole, Wyoming. Jackson is home to sprawling cattle ranches, celebrity estates and roaming herds of buffalo. Tonight we will enjoy the vibrant nightlife of Jackson Hole. We will start our ride today by descending through the twisty Snake River Gorge as we leave the Grand Teton National Park and spend the morning exploring the gentle landscapes of Idaho and Utah as we travel though areas with names such as “Tin Cup Pass” and “Soda Springs.” Lunch is along the shore of the impossibly-turquoise Bear Lake before we take a ride across the Wasatch Mountains through Logan River Canyon. Our evening will be spent exploring the bars and restaurants of Historic 25th Street. With nicknames like Notorious Two Bit Street and Electric Alley, this street was once home to brothels, political scandals, and the “dark ages” of gang rivalries so intense you couldn’t walk the three-block length in safety. Today, 25th Street is a mecca for travelers, art collectors, foodies, and adventurers. Our last day will give us options of continuing our exploration of the Wasatch and its famous ski areas such as Park City, or bee-lining across the high desert to see the salt wastelands of the Bonneville Salt Flats. Whichever route we take, either will be an amazing way to spend our last day on two-wheels together. Tonight we will celebrate our adventure at one of SLC’s famous brew pubs where we will enjoy one another’s company one last time at our Farewell Dinner and raise our glasses to incredible journeys, lifelong memories, and, most important, the kind of friendships that can only be forged on the road. You are now part of the EagleRider Motorcycle Tours family, a symptom of which is that you will never look at vacations the same way again. Let’s meet over breakfast to start planning next year’s ride. The best time to start dreaming is now.